Ice pellets are a form of precipitation consisting of small, translucent balls of ice. Ice pellets are smaller than hailstones which form in thunderstorms rather than in winter, and are different from graupel which is made of frosty white rime, and from a mixture of rain and snow which is a slushy liquid or semisolid. Ice pellets often bounce when they hit the ground or other solid objects, and make a higher-pitched "tap" when striking objects like jackets, windshields, and dried leaves, compared to the dull splat of liquid raindrops. Pellets generally do not freeze into a solid mass unless mixed with freezing rain. The METAR code for ice pellets is PL. Graupel, also called soft hail or snow pellets, is precipitation that forms when supercooled water droplets are collected and freeze on falling snowflakes, forming 2–5 mm (0.08–0.20 in) balls of rime. The term graupel comes from the German language. Hail is possible within most thunderstorms as it is produced by cumulonimbus,  and within 2 nmi (3.7 km) of the parent storm. Hail formation requires environments of strong, upward motion of air with the parent thunderstorm (similar to tornadoes) and lowered heights of the freezing level. In the mid-latitudes, hail forms near the interiors of continents, while in the tropics, it tends to be confined to high elevations. 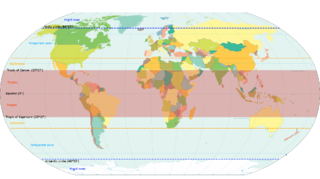 Weather radar, also called weather surveillance radar (WSR) and Doppler weather radar, is a type of radar used to locate precipitation, calculate its motion, and estimate its type. Modern weather radars are mostly pulse-Doppler radars, capable of detecting the motion of rain droplets in addition to the intensity of the precipitation. Both types of data can be analyzed to determine the structure of storms and their potential to cause severe weather. An updraft is a small‐scale current of rising air, often within a cloud. Stones larger than 2 cm (0.80 in) are usually considered large enough to cause damage. The Meteorological Service of Canada issues severe thunderstorm warnings when hail that size or above is expected. 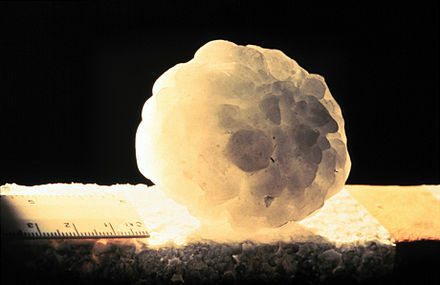 The US National Weather Service has a 2.5 cm (1 in) or greater in diameter threshold, effective January 2010, an increase over the previous threshold of ¾-inch hail. Other countries have different thresholds according to local sensitivity to hail; for instance grape growing areas could be adversely impacted by smaller hailstones. Hailstones can be very large or very small, depending on how strong the updraft is: weaker hailstorms produce smaller hailstones than stronger hailstorms (such as supercells). In North America, hail is most common in the area where Colorado, Nebraska, and Wyoming meet, known as "Hail Alley". Hail in this region occurs between the months of March and October during the afternoon and evening hours, with the bulk of the occurrences from May through September. Cheyenne, Wyoming is North America's most hail-prone city with an average of nine to ten hailstorms per season. To the north of this area and also just downwind of the Rocky Mountains is the Hailstorm Alley region of Alberta, which also experiences an increased incidence of significant hail events. Modern radar scans many angles around the site. Reflectivity values at multiple angles above ground level in a storm are proportional to the precipitation rate at those levels. Summing reflectivities in the Vertically Integrated Liquid or VIL, gives the liquid water content in the cloud. 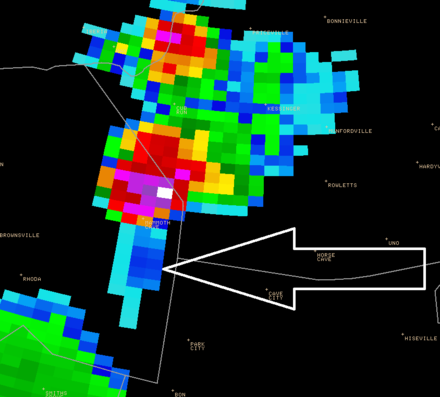 Research shows that hail development in the upper levels of the storm is related to the evolution of VIL. VIL divided by the vertical extent of the storm, called VIL density, has a relationship with hail size, although this varies with atmospheric conditions and therefore is not highly accurate. Traditionally, hail size and probability can be estimated from radar data by computer using algorithms based on this research. Some algorithms include the height of the freezing level to estimate the melting of the hailstone and what would be left on the ground. Depths of up to 18 in (0.46 m) have been reported. A landscape covered in accumulated hail generally resembles one covered in accumulated snow and any significant accumulation of hail has the same restrictive effects as snow accumulation, albeit over a smaller area, on transport and infrastructure. Accumulated hail can also cause flooding by blocking drains, and hail can be carried in the floodwater, turning into a snow-like slush which is deposited at lower elevations. A storm is any disturbed state of an environment or in an astronomical body's atmosphere especially affecting its surface, and strongly implying severe weather. It may be marked by significant disruptions to normal conditions such as strong wind, tornadoes, hail, thunder and lightning, heavy precipitation, heavy freezing rain, strong winds, or wind transporting some substance through the atmosphere as in a dust storm, blizzard, sandstorm, etc. Freezing rain is the name given to rain maintained at temperatures below freezing by the ambient air mass that causes freezing on contact with surfaces. Unlike a mixture of rain and snow, ice pellets, or hail, freezing rain is made entirely of liquid droplets. The raindrops become supercooled while passing through a sub-freezing layer of air hundreds of meters above the ground, and then freeze upon impact with any surface they encounter, including the ground, trees, electrical wires, aircraft, and automobiles. The resulting ice, called glaze ice, can accumulate to a thickness of several centimeters and cover all exposed surfaces. The METAR code for freezing rain is FZRA. A supercell is a thunderstorm characterized by the presence of a mesocyclone: a deep, persistently rotating updraft. For this reason, these storms are sometimes referred to as rotating thunderstorms. Of the four classifications of thunderstorms, supercells are the overall least common and have the potential to be the most severe. Supercells are often isolated from other thunderstorms, and can dominate the local weather up to 32 kilometres (20 mi) away. They tend to last 2-4 hours. A mesocyclone is a vortex of air within a convective storm. It is air that rises and rotates around a vertical axis, usually in the same direction as low pressure systems in a given hemisphere. They are most often cyclonic, that is, associated with a localized low-pressure region within a severe thunderstorm. Such thunderstorms can feature strong surface winds and severe hail. Mesocyclones often occur together with updrafts in supercells, within which tornadoes may form at the interchange with certain downdrafts. In meteorology, precipitation is any product of the condensation of atmospheric water vapor that falls under gravity. The main forms of precipitation include drizzle, rain, sleet, snow, graupel and hail. Precipitation occurs when a portion of the atmosphere becomes saturated with water vapor, so that the water condenses and "precipitates". Thus, fog and mist are not precipitation but suspensions, because the water vapor does not condense sufficiently to precipitate. Two processes, possibly acting together, can lead to air becoming saturated: cooling the air or adding water vapor to the air. Precipitation forms as smaller droplets coalesce via collision with other rain drops or ice crystals within a cloud. Short, intense periods of rain in scattered locations are called "showers." Cloud physics is the study of the physical processes that lead to the formation, growth and precipitation of atmospheric clouds. These aerosols are found in the troposphere, stratosphere, and mesosphere, which collectively make up the greatest part of the homosphere. 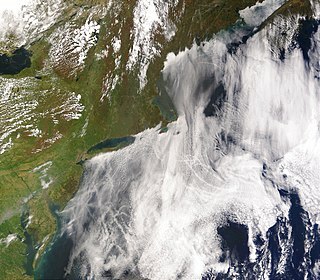 Clouds consist of microscopic droplets of liquid water, tiny crystals of ice, or both. Cloud droplets initially form by the condensation of water vapor onto condensation nuclei when the supersaturation of air exceeds a critical value according to Köhler theory. Cloud condensation nuclei are necessary for cloud droplets formation because of the Kelvin effect, which describes the change in saturation vapor pressure due to a curved surface. At small radii, the amount of supersaturation needed for condensation to occur is so large, that it does not happen naturally. Raoult's law describes how the vapor pressure is dependent on the amount of solute in a solution. At high concentrations, when the cloud droplets are small, the supersaturation required is smaller than without the presence of a nucleus. The bounded weak echo region, also known as a BWER or a vault, is a radar signature within a thunderstorm characterized by a local minimum in radar reflectivity at low levels which extends upward into, and is surrounded by, higher reflectivities aloft. This feature is associated with a strong updraft and is almost always found in the inflow region of a thunderstorm. It cannot be seen visually. The BWER has been noted on radar imagery of severe thunderstorms since 1973 and has a lightning detection system equivalent known as a lightning hole. Severe weather refers to any dangerous meteorological phenomena with the potential to cause damage, serious social disruption, or loss of human life. Types of severe weather phenomena vary, depending on the latitude, altitude, topography, and atmospheric conditions. High winds, hail, excessive precipitation, and wildfires are forms and effects of severe weather, as are thunderstorms, downbursts, tornadoes, waterspouts, tropical cyclones, and extratropical cyclones. Regional and seasonal severe weather phenomena include blizzards (snowstorms), ice storms, and duststorms. Convective storm detection is the meteorological observation, and short-term prediction, of deep moist convection (DMC). DMC describes atmospheric conditions producing single or clusters of large vertical extension clouds ranging from cumulus congestus to cumulonimbus, the latter producing thunderstorms associated with lightning and thunder. Those two types of clouds can produce severe weather at the surface and aloft. Vertically integrated liquid (VIL) is an estimate of the total mass of precipitation in the clouds. The measurement is obtained by observing the reflectivity of the air which is obtained with weather radar. The 1999 Sydney hailstorm was the costliest natural disaster in Australian insurance history, causing extensive damage along the east coast of New South Wales. The storm developed south of Sydney on the afternoon of Wednesday, 14 April 1999 and struck the city's eastern suburbs, including the central business district, later that evening. The 1947 Sydney hailstorm was a natural disaster which struck Sydney, Australia, on 1 January 1947. The storm cell developed on the morning of New Year's Day, a public holiday in Australia, over the Blue Mountains, hitting the city and dissipating east of Bondi in the mid-afternoon. At the time, it was the most severe storm to strike the city since recorded observations began in 1792. The Alberta Hail Project was a research project sponsored by the Alberta Research Council and Environment Canada to study hailstorm physics and dynamics in order to design and test means for suppressing hail. It ran from 1956 until 1985. The main instrument in this research was an S-band circularly polarized weather radar located at the Red Deer Industrial Airport in central Alberta, Canada. ↑ What's the difference between hail, sleet, and freezing rain? Archived 2014-02-02 at the Wayback Machine . The Straight Dope (1999-08-06). Retrieved on 2016-07-23. ↑ Thomas E. Downing; Alexander A. Olsthoorn; Richard S. J. Tol (1999). Climate, change and risk. Routledge. pp. 41–43. ISBN 978-0-415-17031-4 . Retrieved 2009-07-16. ↑ W.H. Hand; G. Cappelluti (January 2011). "A global hail climatology using the UK Met Office convection diagnosis procedure (CDP) and model analyses". Meteorological Applications . Wiley. 18 (4): 446. Bibcode:2011MeApp..18..446H. doi:10.1002/met.236. 1 2 3 John E. Oliver (2005). Encyclopedia of World Climatology. Springer. p. 401. ISBN 978-1-4020-3264-6 . Retrieved 2009-08-28. ↑ World: Heaviest Hailstone | ASU World Meteorological Organization Archived 2015-06-29 at the Wayback Machine . Wmo.asu.edu. Retrieved on 2016-07-23. ↑ Harold Carmichael (2009-06-15). "Sudbury lashed by freak storm; hail pummels downtown core". Sudbury Star. Sun Media. Archived from the original on 2009-06-16. Retrieved 2009-08-28. ↑ Abshaev M. T., Abshaev A. M., Malkarova A. M. (22–24 October 2007). "Radar Estimation of Physical Efficiency of Hail Suppression Projects". 9th WMO Scientific Conference on Weather Modification. Antalya, Turkey. pp. 228–231. ↑ Abshaev M. T., A.M. Abshaev and Malkarova A.M. (2012) "Estimation of antihail projects efficiency considering the tendency of hail climatology change". 10th WMO Conf. Weather Mod., Bali, Indonesia. WWRP 2012–2, pp. 1–4. 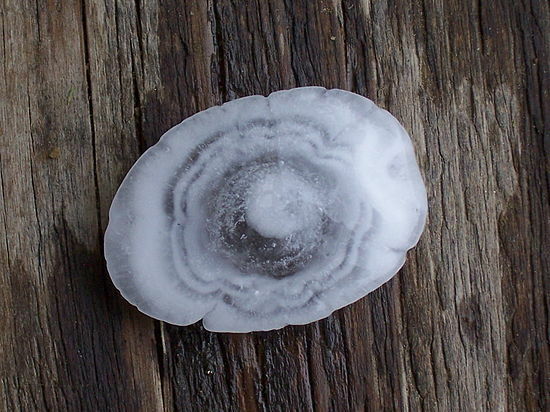 Wikimedia Commons has media related to Hail . Wikisource has the text of the 1879 American Cyclopædia article Hail .